Prevent Mold & Lichen Growth on Easton, Massachusetts Roofing | Boss Services Inc.
A roof is designed to protect a home from weather and other things in the environment. It is important to protect your investment by hiring a licensed and insured contractor, selecting only quality roofing materials and making sure that you take every opportunity to maximize the return on your investment. BOSS Services residential roofing provides a wide range of services aimed at helping homeowners to get the most out of an existing or brand new roof. There are three things that can damage your roof if you don’t take steps to prevent them, which include algae or mold, moss and lichen. Algae and mold are a common plague of homeowners throughout the northeast. Wet weather year-round creates a very hospitable environment for all of these issues, so it is important to learn what you can do about them before they cause damage to your home. Unlike insects or disease that can damage trees and homes, these issues are not an invasion. However, the spores that cause these things to grow are simply present in the air. They only grow if they can find the right environment that has all of the things they need to thrive. As a homeowner, it is your job to do what you can to prevent this type of growth. The Perfect Storm: What Do They Need? You might be surprised that the actual shape and design of the average residential roof is part of what attracts these things in the first place. As the sun moves over your home throughout the day, part of the roof is shaded for a good portion of the day. This shade aids in creating a hospitable environment for algae, mold, moss and lichens. It allows water to accumulate, provides a moist environment, and shields it from the damaging UV rays of the sun. There are other things that can influence or increase this environment, including overhanging tree branches and limbs, as well as the quality of roofing materials used by your Easton construction and remodeling contractors. Most shingles come with anti-mold and mildew ingredients already built-in, but you can hire a licensed and insured contractor in Easton, Massachusetts to spray preventive or removal treatments for mold, algae, moss and lichen. Taking a pro-active approach can save you a lot in cleaning and repairs due to damage. If you want to prevent the growth of mold and lichen, as well as moss or algae, consider having BOSS Services residential contractors install zinc flashing strips under some key shingles. 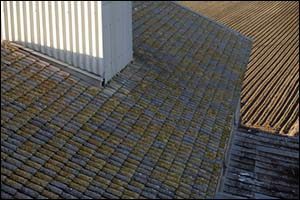 The natural run-off after rain or melting snow, helps to prevent mold, mildew, lichens and others, from growing on your roof – even in the perfect growing conditions. Homeowners should always work with a reputable, licensed and insured contractor for best results. Quality roofing materials and skilled installations provide you with long-lasting preventive care. Depending on the type and size of roof that you have, your Easton construction and remodeling team will either use custom cut strips of zinc flashing or pre-made strips. They will also provide consultation for your property, suggesting other things that you can also do to prevent mold and lichen growth at your Easton, Massachusetts home, just by pruning trees, removing overhanging tree branches and helping the roof to dry out quickly after a rain or other weather conditions occur. Contact BOSS Services, Inc. to learn more about zinc flashing strips and how they can help to protect your roof. In addition to being unsightly and staining to your quality roofing materials, it is important to understand why mold, lichen, algae and moss are bad for your home. Over time, these things can actually weaken your roof, causing premature damage, which can result in leaks. These natural substance are also very attractive to insects and other pests, which can thrive and build nests in this type of environment. Ultimately, all of these things can come together to cause damage to your home, create an unsafe environment and contribute to health problems, such as asthma or allergies. If you are a home or property owner in the Greater Easton, Massachusetts area, contact BOSS Services for residential services. As a licensed and insured contractor, our team uses only the very best in quality roofing materials and installation techniques. Make sure to ask about our Smart Choice Roof System Solution for long-lasting, great-looking solutions. Give our Easton construction and remodeling service a call at 508-297-0635 to get a QUOTE on your next home remodeling, repair or renovation project.